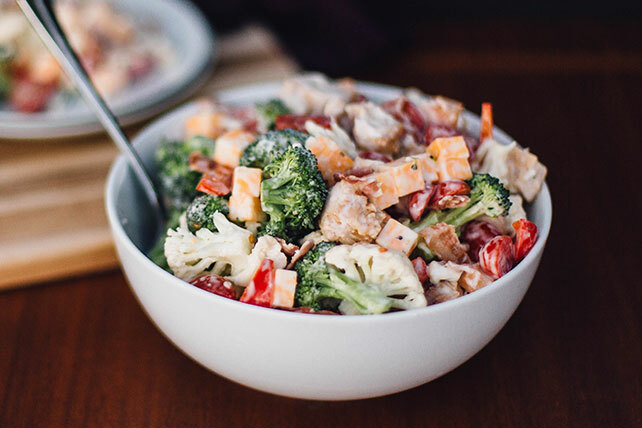 Made with broccoli, cauliflower, red peppers and cherry tomatoes, this chilled chicken salad has nearly every color of the rainbow! Combine vegetables, chicken and tomatoes in large bowl. Add dressing; toss to coat. Add cheese and bacon; mix lightly. Substitute 1 pkg. (6 oz.) OSCAR MAYER CARVING BOARD Flame Grilled Chicken Breast Strips, chopped, for the chopped cooked fresh chicken. Prepare using KRAFT Classic Ranch Dressing. Serve in Bibb lettuce cups.